Let’s call it like it is – the exposure at a showcase event is essential! We have a reputation for providing the most college coaches per event at every event guaranteed! This happens for one reason: we have an amazing relationship with our college coaches. 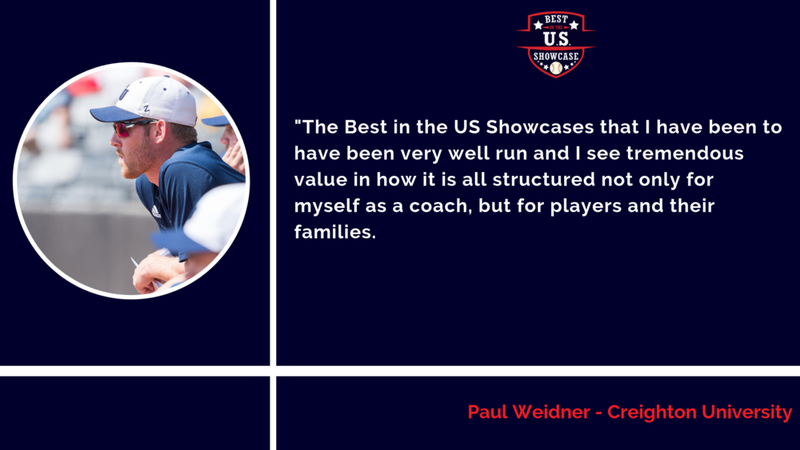 We accommodate our college coaches unlike any other event in the country, which is why we are able to GUARANTEE the coaches will attend our events. Our goal is to provide colleges of ALL levels to come and evaluate you, in hopes of finding the right one to continue your baseball career. Ever wonder how to get back in touch with a college coach you met at an event? 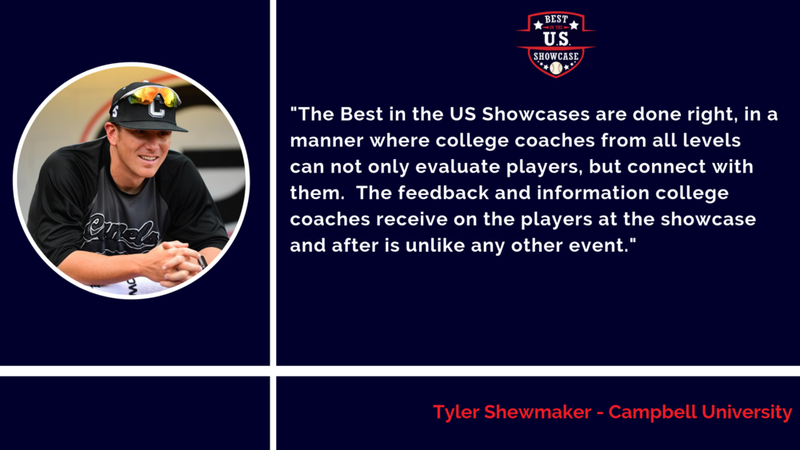 At the Best in the US Showcases, we equip all players with the TOOLS FOR TOMORROW they need to navigate the recruiting process long after our showcase event. Every player (and parent!) 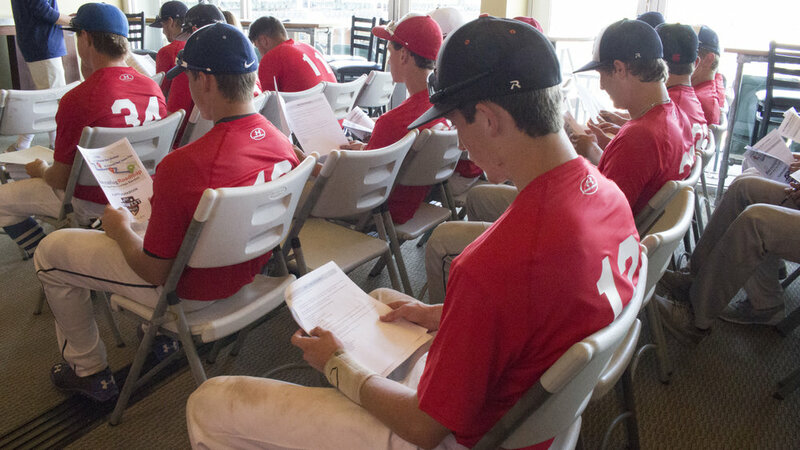 at our showcase will participate in a recruiting seminar called Recruiting Roadmap: Your 3 Step Plan to College Baseball. This seminar provides the information you need to know for your recruiting journey. In addition to the seminar each player will receive two amazing digital resources. 1. 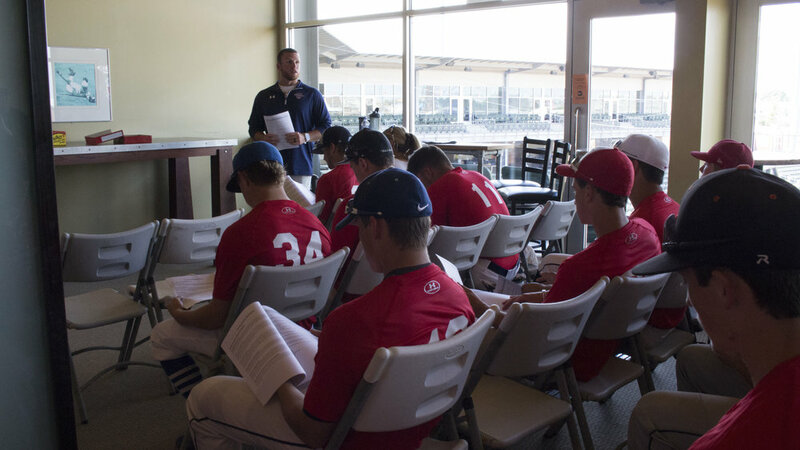 Recruiting Roadmap: Recruiting Roadmap is our own created online course specifically designed to help any high school baseball player navigate the recruiting process and develop a personalized plan to achieve their goal of playing college baseball. 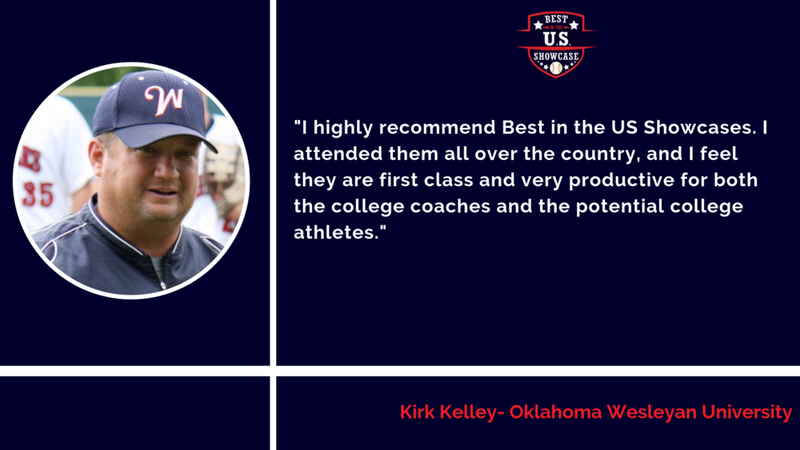 When you attend the Best in the US Showcase you get lifetime access to our Recruiting Roadmap Online Course! 2. Online Player Page: Every player will have their own personal profile created for them after the event. 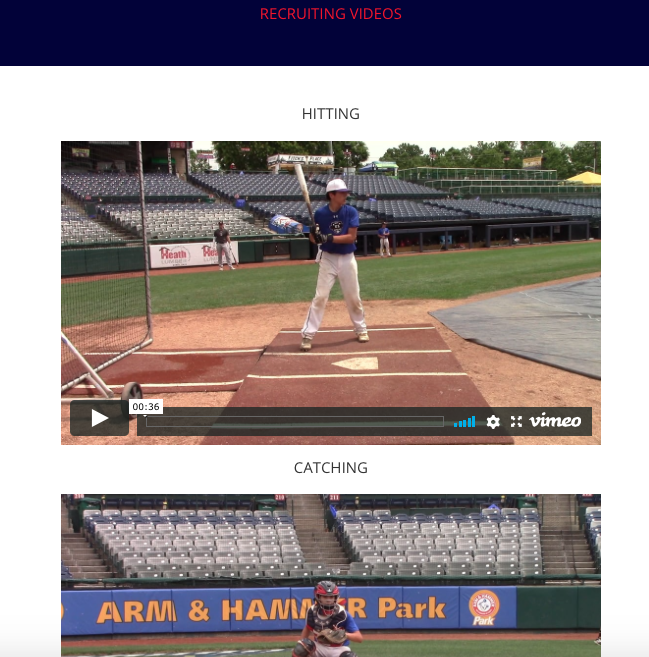 This profile includes video of their pro style workout and a full recruiting profile that is able to be updated at any time. There is no pay-wall for you or college coaches to edit or see! Learn More About the Recruiting Tools! This is the most important part of our events. We want to make it clear to all players, parents, and everyone involved that we are NOT promising a scholarship, not promising you will get drafted , and not promising that you will dominate the event. What we do promise is this. We promise to give you an honest opportunity to showcase yourself as a baseball player and a person to a large number of college coaches. We promise we will give you a professional and relaxed environment and help every athlete to perform at their absolute best during a nerve-wracking process. We promise to give you every promised opportunity to show how hard you've worked and the baseball player you are! 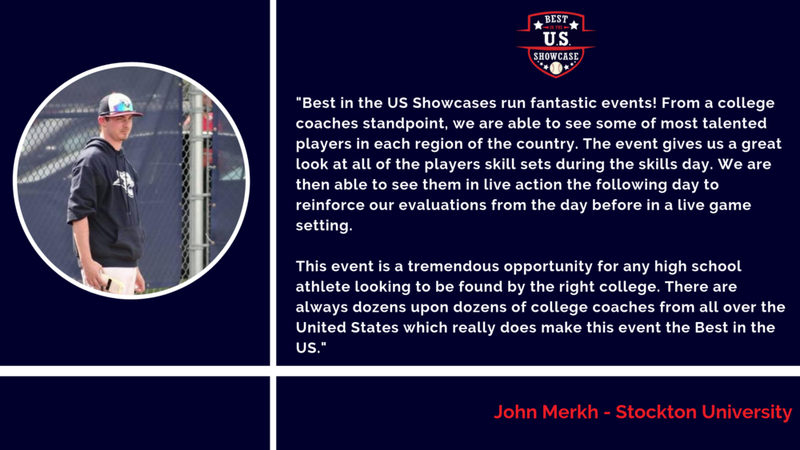 What Do College Coaches Say About Our Events? Want to Receive an Invite to a Future Event? Sign up with your email address to receive an invite and updates! Thanks! Check your email frequently for an invite to our next event!